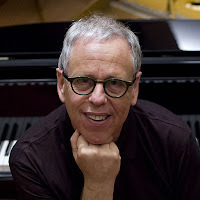 Composer, arranger, educator and guitarist Darrell Katz has lived and worked in the Boston, MA, area now for over four decades. 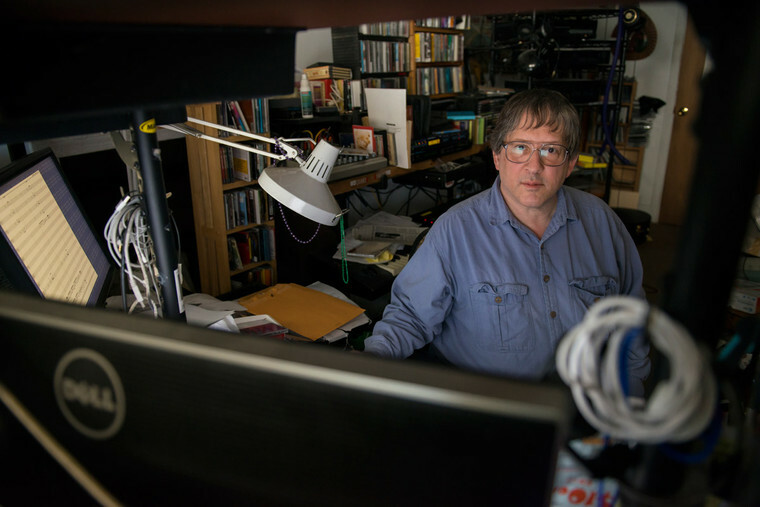 In 1985, he was one of the founders of the Jazz Composers Alliance, an organization with aims similar to those of the Chicago's AACM and New York City's Jazz Composers Collective; among those aims was to promote the work of a variety of artists in the area . 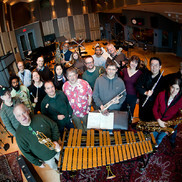 JCA also formed an orchestra to work whose early concerts and commissions featured the likes of Julius Hemphill, Sam Rivers, Dave Holland, Maria Schneider, Fred Ho, and others. The JCAO has been featured on the majority of Katz's albums. 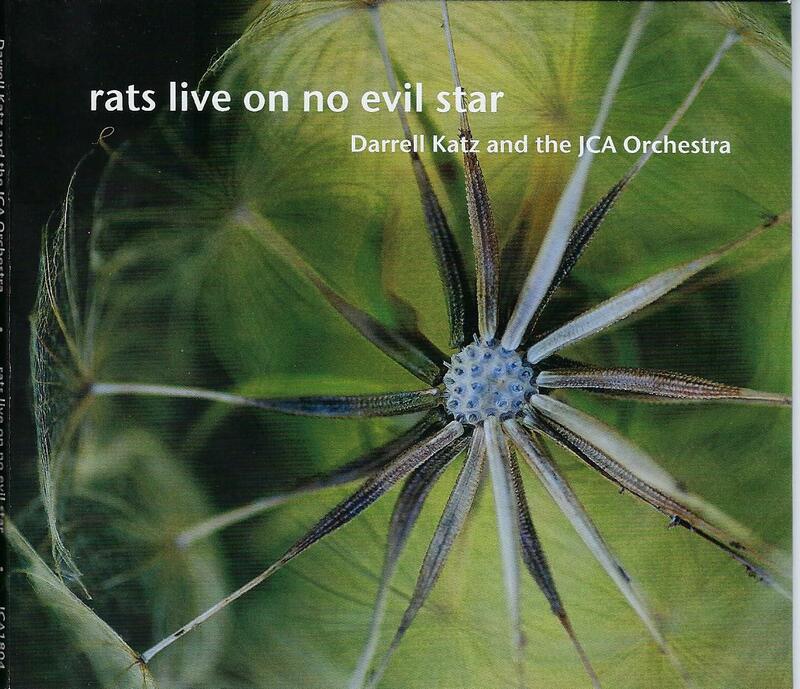 His latest aural adventure, "Rats Live On No Evil Star" (JCA Recordings), is a sprawling set of songs that cover many topics and myriad genres. The opening track, the title song, is a multi-part composition originally composed for the chamber music duo Marimolin in 1987. Here, it is expanded for the 19-piece ensemble. The evocative marimba work of Vessela Stoynova, the powerful violin playing of Helen Sherrah-Davies, the wordless vocals of long-time JCAO associate Rebecca Shrimpton, the saxophones solos of Rick Stone (alto) and Phil Scarff (tenor), are highlights; then again, so is the brilliant orchestration and the use of Bill Lowe's expressive tuba along with Mike Connors funky drumming. After that concerto-style opening track comes the three-part "How To Clean a Sewer" - at 35+ minutes, the music goes in so many directions. Part I, titled "3 or 4 Kinds of Blues", has so much going on, different groupings of instruments "conversing" with each other all revolving around a simple blues melody. Again, the marimba is a major rhythmic and melodic voice as is the violin. Part II, "Windfall Lemons (air, earth, water, fire)", is also blues-based but this time revolves around poem written by Katz's late wife Paula Tatarunis. It's fascinating how Ms. Shrimpton can make such "dark" lyrics sound so inviting. Part III, "Attention", also revolves around lyrics: this time, it's Simone Weil's quote "Attention is the rest and purest form of generosity." Now, one hears the influence of Neal Hefti and Henry Mancini in the arrangement as well as more modern arrangers. By this time, one is already 49 minutes into the album and there are still four more tracks. Each one of the remaining cut stands out but it's the album closer, "Red Sea", that truly stands out. Ms. Shrimpton adapted an essay from Ms.Tatarunis, a remembrance of a fascinating man that poet had met early in life who returned other life much later. The vocalist also wrote the music along with Katz who plays guitar on the track. This trio piece is rounded out by pianist Alizon Lissance, yet another musician on the album who works at Berklee College with the leader and vocalist. This music is quite handsome underneath Ms. Shrimpton's heartfelt vocal. It's a gentle ending to a program that has great energy, at times, blending flashes of anger with long passages of brilliant music. 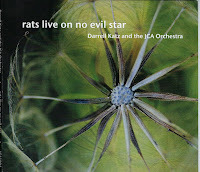 "Rats Live On an Evil Star" is, like other Darrell Katz recordings, one that you should take time with. Enjoy the music, the hairpin curves, the quick turns, the powerful lyrics yet don't ignore the settings and the orchestrations that Katz creates throughout. The brilliant juxtaposition of the mallet instruments with the "low" sounds of the baritone saxophone and the tuba, the voice with the violin, the sectional work and the short, pithy, solos; that and more makes this album an exciting adventure from beginning to end. For more information, go to www.darrellkatz.com. Ernesto Cervini wears many hats. He's a drummer, composer, arranger, publicist, husband, father, and brother to vocalist Amy Cervini, all the while leading or co-leading several ensembles. One of those ensembles is Turboprop, a sextet that features bassist Dan Loomis (he of the thick tones and penchant for melodies), pianist Adrean Farrugia, tenor saxophonist Joel Frahm, alto and soprano saxophonist Tara Davidson (she also contributes flute), and trombonist William Carn. The sextet has just issued its third album, "Abundance" (Anzic Records) that is an aptly titled collection of originals and standards. 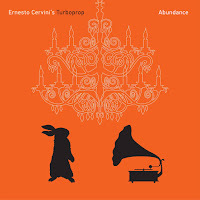 The album gets its name from Loomis's "Abundance Overture", a splendid tune with a folky opening melody (played by flute and accompanied by Cervini's sticks. The horns enter, the piece takes on a jaunty feel and everyone plays with great joy. This is quite a versatile ensemble that often sounds as if it's much larger. Farrugia's "The Ten Thousand Things" is a high-powered romp with moments where the band drops out and you just hear the composer's fine chord work. The band really flies during Frahm's muscular solo, powers by a rampaging rhythm section. The leader's "Song For Cito", perhaps the only song you'll ever hear dedicated to the former manager of the Toronto Blue Jays Cito Gaston. Carn's hardy trombone solo is followed by a high-powered romp from the pianist. "Gramps", the other original by Cervini, is a ballad dedicated to the drummer's grandfather yet it too has an intensity that shows up as the Ms. Davidson moves through her solo. The piece does return to its gentle roots as the ensemble slows to the finish. On an album loaded with highlights, none shine brighter than the two back-to-back standards. First, there's the powerful "My Shining Hour", a Howard Arlen that Cervini heard on a Geoff Keezer solo piano album. The arrangement opens with a splay of all the instruments before the pianist leads the way into the melody that is played by the reeds and trombone. It's the trombone that gets the lead on the gentle reading of "Smile", the Charlie Chaplin composition that the composer, writer, and director wrote for the soundtrack of his 1936 movie "Modern Times." The spotlight is on Carn for the first three minutes of the piece but do pay attention to how the rhythm section frames his solo. Loomis steps out for a solo - he's so melodic, always going for the emotional heart of the song and not showing off his technique. "Abundance" is the sound of a sextet that is comfortable with each other, willing to challenge each other, and having a great time making good music. There's much to enjoy when Ernesto Cervini's Turboprop gets together - give them a close listen! Every once is a while, the reviewer receives an album that wins you over initially on the strength of the joy that the musicians exude. 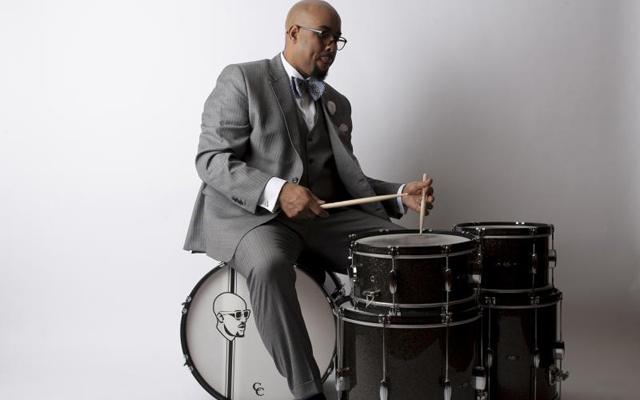 Such is the case with the debut recording by drummer, composer, and arranger Henry Conway III. 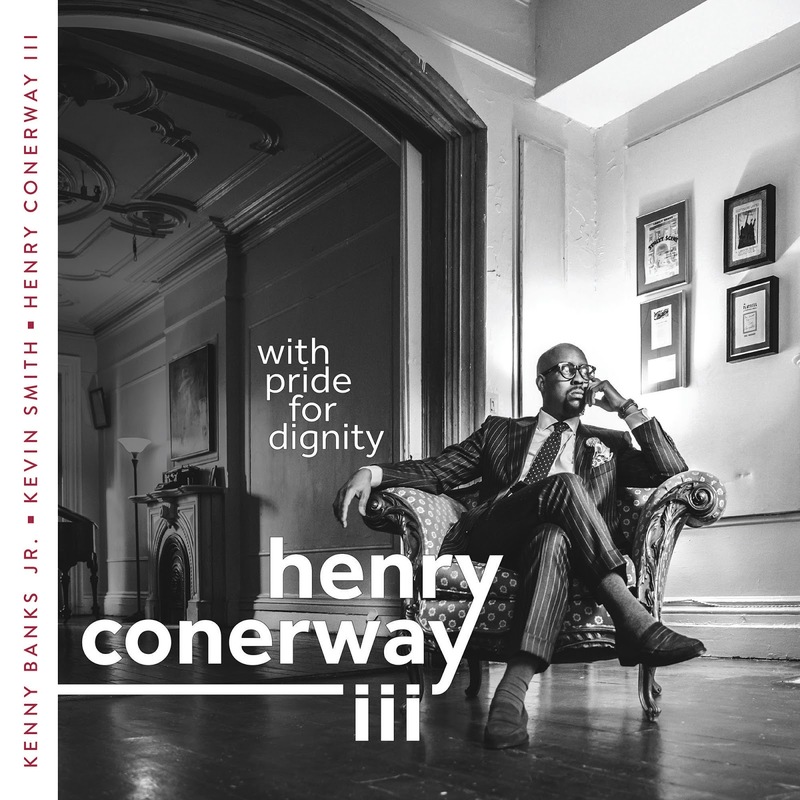 "With Pride For Dignity" (self-released) finds the Detroit, MI native leading a trio that features Kenny Banks Jr. (piano) and Kevin Smith (drums). 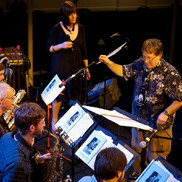 It's a cooperative ensemble with all three musicians contributing arrangements and/or songs. Listening to the opening track "Slippery" (composed by Ray Brown and arranged by bassist Smith), the first impressions I had after "how delightful" was how much the overall blues feel sounded like the musical approach of Phineas Newborn Jr. and what a lyrical bassist Smith is. The leader does not impose his will on any song but you cannot miss his presence. The title track (composed by Banks Jr.) is an episodic journey that, at times, feels like the history of jazz going into your ears. Note how the tempo changes happen on a dime, how the music swings with power, and all three musicians are tuned in to each other. 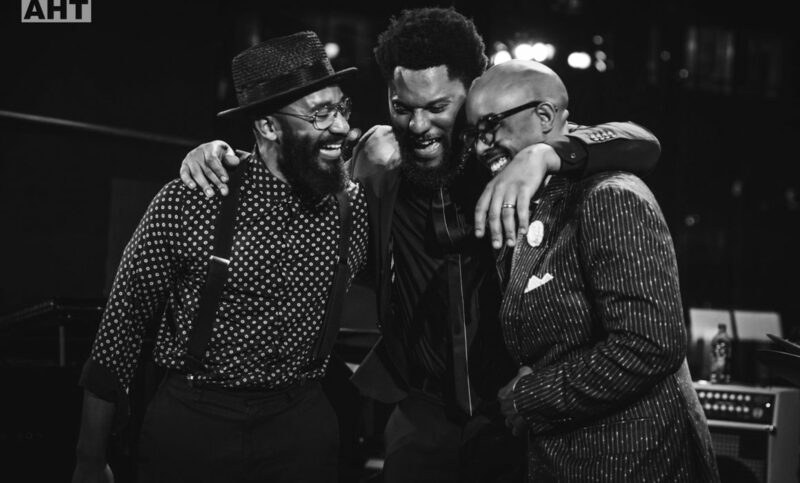 The trio pays tribute to composer/musicians such as Duke Ellington ("Cottontail"), Jimmy Heath ("Gingerbread Boy"), Detroit native, and mentor to the drummer, Marcus Printup ("Hopscotch"), and the afore-mentioned Phineas Newborn Jr. ("Sugar Ray"). Each on of the tunes shines on the power of its melody and the reinvention of a modern ensemble. Both the Printup and Newborn Jr. songs are "deep blues" with the former having an irresistible rhythm as well as the hint of "rent party" piano while the latter has such a jaunty feel with Banks Jr. digging into his solo over the walking bass lines and the "easy" beats from the drummer. "Cottontail" speeds forward on the power of the brilliant brushes work and an inventive bass line (here's where the listener detects the Ray Brown influence on Smith). The leader starts on supplying the rhythm of "Gingerbread Boy" aided and abetted by the bassist and the pianist's left hand. Once Conerway III switches to his sticks, the trio is off on a romp. The pianist's "The Feel Goods" and the drummer's "Carvin's Agreement" closes the proceedings; the former is a delightful medium-tempo blues and the latter a solo drum piece. Even though there are no ballads on the program, neither does that lack bother this reviewer. At this time of such negativity in the U.S. and elsewhere, the brightness of this music, the obvious joy of the musicians as they move through the songs, the promise of more-to-come, is a breath of fresh air. Plus, this album reminds you of the power that the blues has to settle one's mind and to assure you we're all on this trip together. 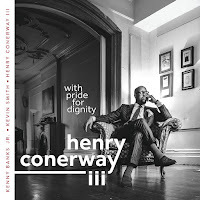 Kudos to Henry Conerway III and his trio! To find out more, go to thehc3.com. 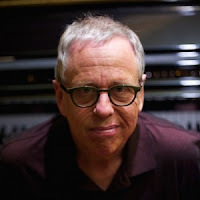 Over the past four decades, pianist, composer, educator, and author Kenny Werner has created music that can move one's feet, touch one's heart, capture one's mind, and explore the far corners of our world as well as our worlds of emotions. 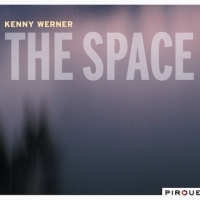 "The Space" (Pirouet Records) is his 35th release as a leader or co-leader and his fifth solo recording. The program features three originals, two pieces from label owner and saxophonist Jason Seizer, two standards ("You Must Believe in Spring" and "If I Should Lose You"), and a fascinating take on a Keith Jarrett improvisation. The Jarrett piece, "Encore From Tokyo", an excerpt of a piece first heard on the 1976 ECM album "Sun Bear Concerts", is one of those delightful pano romps the composer/improviser creates during his shows - here, Werner's performance finds the joy of the piece, the uptempo yet entrancing rhythm, and the lyricism that hints at Charles Lloyd's "Forest Flower." The title track opens the album. At 15:57, it's the longest track on the recording, moving from melody to rhythm to a pleasing combination of both, soothing the listener, the "spacious" (no pun intended) sound and clear audio makes every note stand out. Really, what the composer and the pianist expects is that the listener will surrender to the charms of the music, throw away labels, allow the music to bot out out extraneous sounds, close one's eyes, and relax. This is not a "new age" trance dance but an adventure in which the listener is allowed into the mind of the creator. There is no other piece on the album that sounds like this one yet it sets the stage for all that follows, "loosens up" the listener, and you are ready to follow Werner everywhere his fertile mind takes him. And, it's a treat. From the Jarrett tune to the lovely take of Michel LeGrand's "...Believe in Spring" to both of Seizer's elegant compositions to the gracious flow of the Rainger/Robin classic "If I Should Lose You" (from the 1936 movie "Rose of the Rancho"), this is music that gets its hooks (pun intended) into you. The other two Werner originals are "Fifth Movement" and the album's close track "Fall From Grace." The former, which does right after the Jarrett piece, is somewhat more introspective yet also displays flashes of lengthy melodic flourishes throughout; but, listen to the pianist's left hand as it suggests both a rhythm and a bass line. The latter cut opens with a handsome, stately, melody. The steady left hand chords set the pace and do not let down, hinting at a J. S. Bach air. That slow but steady pace makes the piece very much of a closing statement. "The Space" deserves tome listened to all the way through time and time again. Kenny Werner continues to create music that follows no one's directions but his own. The avid listener is the grateful beneficiary.